Who is this dashing, mustachioed Mortdecai chap? An art dealer, you say? A man of high breeding with impeccable taste in paintings and wines? A scalawag, a ne’er-do-well, a man of shady intentions? That clears things up a bit, but still, who is Mortdecai? A putz, a schlemiel, a real screwup, an oaf dressed in aristocrat’s clothing? A self-obsessed buffoon, an effete clown? The main character in a slightly obscure quartet of books by English author Kyril Bonfiglioli? Okay, we’re getting somewhere, but now that we’ve surveyed the circumference of the man, another question needs asking: Why did anyone think to adapt the misadventures of Charlie Mortdecai from page to screen for an American audience? We Yanks like our British imports, or at least faux British imports; we made all three Austin Powers films into box office smashes, and those movies only went so far as to feature English actors in supporting roles while Mike Myers affected the best homogenous London accent he could muster. So maybe David Koepp’s Mortdecai doesn’t pose that much mystery after all. The film follows in the footsteps of the Powers pictures relatively closely, though there’s a good bit of The Pink Panther mixed in here, too. Johnny Depp’s Mortdecai isn’t just ineffectual, he’s ineffectual to the detriment of everyone around him, particularly his charmingly thuggish manservant, Jock Strapp (Paul Bettany). Yes, it’s that kind of movie. Not that that’s a bad thing, of course, because Mortdecai’s family resemblances lend it a bit of rub-off charm that keeps the film from wearing out its welcome over its hundred-minute running time. But Depp is no Peter Sellers, no matter how hard he tries, and Koepp is no Blake Edwards. (He isn’t even a Bud Yorkin.) So Mortdecai mostly just exists. It’s there. It’s not particularly awful, and it’s not particularly good. It’s a caper picture in which MI5 agent Inspector Martland (Ewan McGregor) conscripts Mortdecai, on the brink of financial ruin, to aid him in tracking down a long-lost and recently stolen Goya painting. Somehow the story almost feels like an afterthought, because really this is a movie about a man and his mustache. 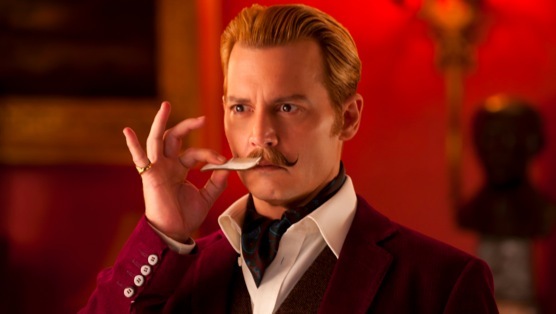 If you’ve seen TV spots for the film, then you already know Mortdecai’s lip rug. He thinks it rather enchanting. His wife, Johanna (Gwyneth Paltrow), thinks it’s horrific, as does pretty much everyone else Mortdecai interacts with throughout the film. Somehow, the simple matter of a curly-tipped upper lipholstery becomes the running joke for the entire picture, and while sometimes it actually works, it’s mostly just tiresome. (Koepp also misses a great opportunity to take the mickey out of hipsters’ shallow fascination with ironic facial hair.) Apart from Charlie’s mouth brow, Jock’s inexplicable loyalty toward his employer and Martland’s obsession with Johanna, though, the humor is sorely lacking. A snicker here, a polite chuckle there, but not a belly laugh in sight. The leaden story is by-the-numbers stuff. Mortdecai moves listlessly from point A to B to C, only to arrive at its climax, leave off with one more mustache gag, and roll credits. If the script had smarter punchlines, Koepp’s disinterest in the plot might be forgivable; conversely, if the film had better plotting, its muted sense of humor might be less of a downer. Depp is as overwrought as anyone might expect based on his recent career choices, but he and his fellow cast members (particularly Bettany) are the only ones getting it right—mugging and hammy theatrics work within the framework of willfully goofy comedy, and for whatever else Mortdecai is, it’s certainly that. If only it were funny. Boston-based critic Andy Crump has written about film for the web since 2009, and has contributed to Paste since 2013. He also writes for Screen Rant and Movie Mezzanine. You can follow him on Twitter. Currently, he has given up on shaving.